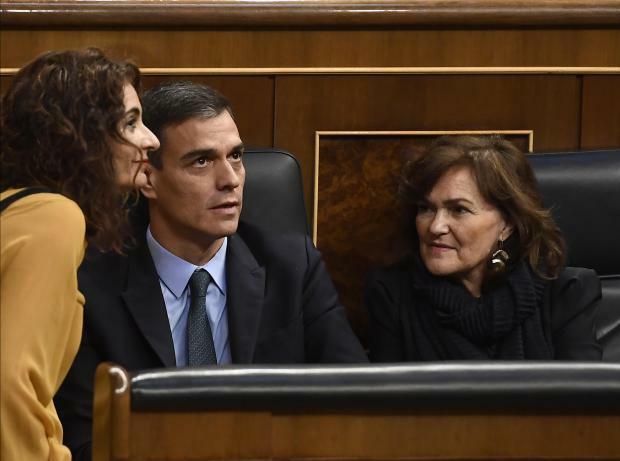 Spanish Prime Minister Pedro Sanchez (C), Deputy Prime Minister and minister of equality Carmen Calvo (R) and Spanish minister for finance Maria Jesus Montero (L) attend a debate on the government's 2019 budget. Right-wing and Catalan separatist lawmakers on Wednesday rejected Spain's draft 2019 budget, a move that could force Prime Minister Pedro Sanchez into calling early elections. Sanchez, who came to power in June thanks in part to parliamentary support from 17 Catalan lawmakers, was depending on their votes to push his first budget through but they withdrew their backing. All eyes are now on whether the socialist premier, who leads a minority government, will call early elections with opinion polls showing one outcome could be a right-wing majority in parliament, including a newly emerged far-right. Sanchez's socialists are already adopting a campaign-like tone, accusing conservatives and Catalonia separatists of blocking a budget that included many social spending measures. "The right-wing in this country is trying to put a brake on the social progress of this budget and this government," Budget Minister Maria Jesus Montero said after the rejection. "It's trying to stop this country from moving forward," she said, adding it was likely early elections would be called but refusing to comment further. Conservatives are furious with the socialist government for negotiating with Catalonia's separatist executive as Madrid tries to ease tensions with the northeastern region after a secession attempt in October 2017. While Madrid says it initiated talks to try and find a way out of an ongoing crisis as Catalonia's government continues to want independence, the opposition has accused it of yielding to separatist demands merely to stay in power. Pablo Casado, leader of the conservative Popular Party (PP), said the budget rejection marked "the end of the road for Pedro Sanchez as prime minister." "It's now really pressing to call general elections." Apart from social measures, the budget also contained an increase in investment in Catalonia. But with pro-secession leaders in the dock for their role in the 2017 attempt to break Catalonia from Spain - a trial labelled a "farce" by separatists - Catalan lawmakers whom Sanchez depends on filed amendments to block the budget last week. On Friday, negotiations between Madrid and the Catalan government broke down. So it was that the parliament approved their amendments on Wednesday with 191 votes in favour in the 350-member assembly, defeating the budget. Sanchez' government would now in theory have to present a new, revised version of its budget. In the current climate, though, with Sanchez left with so little parliamentary support, analysts predict he will call early general elections. "Legally he is not obliged to do so," said Antonio Barroso, deputy research director at the Teneo analysis group. "But politically, the question is whether the government would be justified (in not calling polls)." Various opinion polls - the latest published on Wednesday in online daily eldiario.es - point to a right-wing majority in parliament post-elections formed by the PP, centre-right Ciudadanos and far-right Vox party. Even before the vote, the socialist government was accusing right-wing and separatist parties of opposing a social budget that contrasts with the austerity of Mariano Rajoy's previous conservative executive. "After seven years of social injustice, right-wing forces and the independence movement will vote against a social budget," Sanchez tweeted on Tuesday. "Both want the same thing: that Catalonia be at war with itself and that Spain be at war with itself."